Bancyfelin’s new milestone has been unveiled. 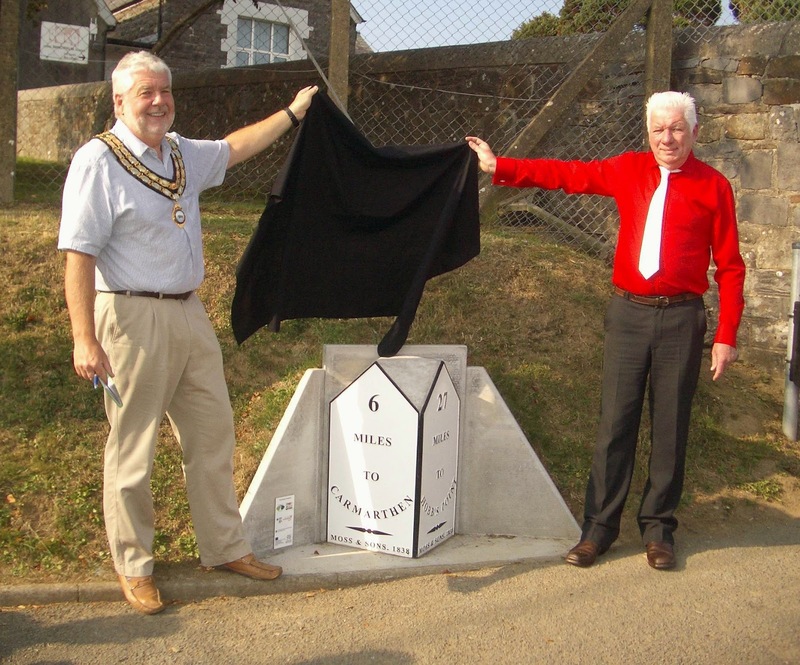 Local historian Bruce Wallace is pictured being helped by Cllr Graham Edwards, mayor of St Clears, as he unveils the new milestone installed in Bancyfelin by the Bancyfelin Education Community Trust. It was the Romans who were the first great road builders in Britain and the first to measure road distances. When they left, the roads developed in response to community needs and by the 1800s, there were around 20,000 milestones of varying designs in Britain and some of these were on the A40 road from Carmarthen to Hobbs Point in Pembrokeshire. Their purposes were to inform travellers of direction and distances, help coaches keep to journey times, help calculate fees for changes of horses at the coaching inns and before 1840, calculate postal charges. Bancyfelin village was on the main highway to Hobbs Point where travellers embarked for Ireland and it had its own milestone in the form of two metal plaques placed in a V-shape projecting onto the main road. Its position was near the current school and it distanced six miles to Carmarthen and 27 miles to Hobbs Point. It was made by Moss & Sons in 1838 (one year before the Rebecca Riots began) along with other similar milestones along the main A40 highway. Sadly, this original milestone was mislaid when the front of the school was refurbished around 50 years ago. In 2013, the Bancyfelin Education Community Trust reacted to community need by sourcing a replica milestone with financial support from the Carmarthenshire Landscape and Heritage Grants Scheme which is part funded by Natural Resources Wales, Rural Development Plan, Welsh Government and Carmarthenshire County Council and in kind by the National Trust. Nice to se the milestone back - amazing how the original could have been 'mislaid'. Looking on old maps there was a boundary stone in the Pont Coch too - but searching streetview it does not seem to be there any more.